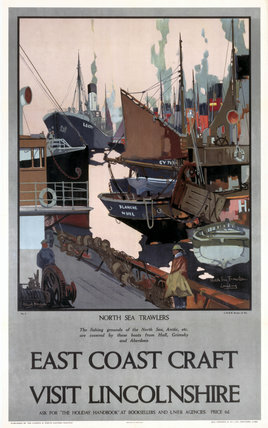 London & North Eastern Railway poster showing North Sea trawlers'. The caption continues 'The fishing grounds of the North Sea, Arctic, etc are covered by these boats from Hull, Grimsby and Aberdeen'. Artwork by Frank Mason (1876- 1965). 'Havens and Harbours on the LNER', railway poster, 1923-1947. 'Sentinels of Britain's Beauty', LNER poster, 1923-1947. 'Tourist Routes in Scottish Highlands', LNER poster, 1923-1947. 'Havens and Harbours', LNER poster, 1923-1947. 'East Coast Havens', BR (ER) poster, c 1950s. 'The Norfolk Broads', BR poster, 1948-1965. 'St Andrews', BR (ScR) poster, c 1950s.